On November 22nd Gaia Innovation Ltd supported fellow Automotive 30% Club member Toyota GB to deliver an Automotive Apprenticeship event at the Toyota Academy in Derby. Over 50 young female students and staff came together to learn about apprenticeships in the automotive industry. The students were inspired to consider both technical and non-technical roles in a STEM related industry. Discover Toyota – In this session, students engaged with the ‘world of Toyota’ through a presentation given to boost their awareness of Toyota’s history and heritage. Toyota Careers – Customer Care – Current Apprentices and Trainers provided students with an understanding of the roles of Service or Parts Advisor at Toyota dealership. They were also informed of career opportunities and the recruitment process. Apprenticeships – This session gave the female students a technical overview of fuel cell technology, the service technician apprenticeship programme, and the qualifications that can be gained from the programme. Toyota Manufacturing – The students were then given an exciting tour of Toyota’s manufacturing plant. This engaging and hands-on session enabled students to understand how robotics work. They were also informed of the apprenticeships available within manufacturing and how this could benefit the industry in the future. 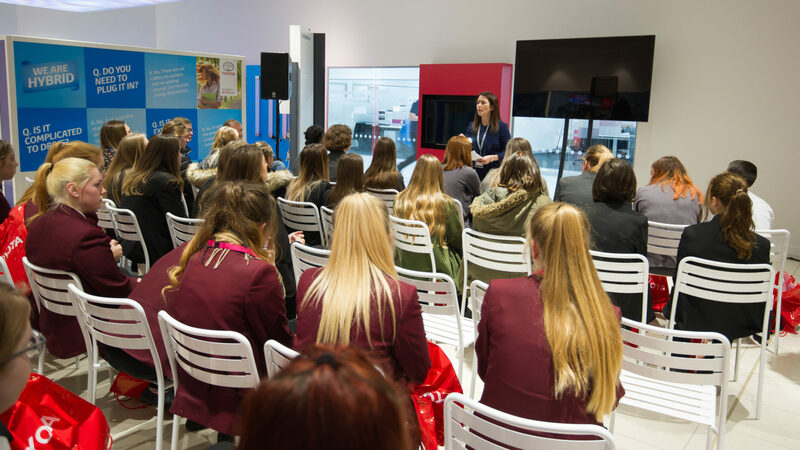 Feedback from both the guests and the Toyota team indicated that the event achieved the goal of inspiring young women to consider apprenticeships and careers in the automotive industry. This is a key aim of the UK Automotive 30% Club, and of Gaia Innovation and Toyota GB. At the close of the event Julia Muir, CEO of Gaia Innovation and Founder of the UK Automotive 30% Club gave a speech to the girls about the need for them to equip themselves with the necessary personal, social and technology skills for working in the machine and robot dominated 4th Industrial Revolution. She told them how growth sectors such as automotive have huge skills deficits, that there are no “male jobs and female jobs” and that we need more women to work in advanced technology industries. She said that at the moment cars are largely designed by men, engineered by men, built by men, sold by men, but are bought by women, in fact 80% of global car purchase decisions are influenced by women.